Snack Break! Waffles for one? So, while I should be blogging about my dissertation or teaching related things, I’m slightly stressed and thought it would be a good time for a snack break! 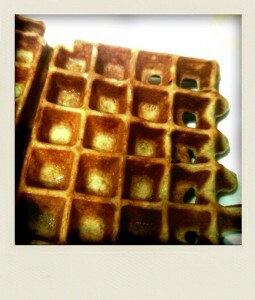 Perfectly portioned to fill one side of the All-Clad 4-square Belgian Waffle Maker. Step 4: Whisk buttermilk into egg, whisk in vanilla, whisk cooled butter into the mix. Step 5: Mix wet and dry ingredients – give it a few nice stirs to make sure all ingredients are incorporated. And there you have it – two perfect waffles emerged from the Cadillac, I mean @allclad waffle iron. I drizzled with some local honey and enjoyed my waffles with no leftovers and only a few small bowls to clean up! Enjoy – and let me know if you try out the recipe! 25 Responses to Snack Break! Waffles for one? .-= Marvin E. Graves´s last blog .._DSC6105 =-. i used white, whole-wheat flour and 2 T. egg substitute for the egg (didn’t feel like measuring half an egg), and it filled my waffle maker perfectly (oh yes, and fresh blueberries in the batter, too). Thanks Hannah! I’ll try with your tweaks & egg substitute next time!! I’m on my way to try this. I got this waffle maker and now my family doesn’t want to eat them! Will let you know what happened. Sounds yummy. Thank you so much! My family hates waffles but I love them so this recipe is a great just for me recipe! Hi! Perfect! I substituted Fage Greek yogurt for buttermilk and butter and added a little water until the consistency was right, but it made two perfect waffles. Thanks! That sounds great! I’ll have to try those changes myself! I made this wonderful recipe for myself after the rest of the family had eaten, but inevitably they looked and smelled so good I had to make another one…. Needed recipe 4 1! Can’t believe no 1 else has 1 on google! These are amazing – its just me and dd in the house, and she doesnt like waffles, but half a fried egg went down very well instead! I used normal plain flour as well, just bcause thats what we had in the house at the time, and milk instead of buttermilk. I also made them with a small egg instead of half a large one when i did it again, and they turned out well then too! I love this! I was on my way to work yesterday and was craving just ONE waffle. I had no time to fool with a big bowl of batter. I was able to mix this recipe up in a small bowl and use it in my regular waffle maker. It made 1 perfect waffle! I was so satisfied! Thanks for your work on this project! I will use your recipe over and over again! THanks! I found them a little thick- added a little more liquid. Stirred frozen blueberries into the dry mix before combining. Just perfect for one! Thanks so much. My son never has breakfast. I’ve tried to get him to eat anything on school days….. till I found ur amazing recipe.. you’ve made my five yr old very happy! Takes me 15 mins to knock it up fresh every morning. Thank u! I really wanted waffles for dinner tonight but didn’t feel like making a huge amount of batter and I am so happy I came across your recipe! It was so delicious…I absolutely loved the cinnomon, it added such a wonderful touch. I will definitely be using this recipe in the near future. Thank you! Happy that my search for a waffle recipe for one found this one this morning! I followed the recipe exactly, but as there was unusually no cinnamon in the kitchen I substituted a bit of freshly ground nutmeg and a pinch of ginger powder. Turns out this was a lovely combo. Served with grilled free-range bacon, half a fig, some blueberries and maple syrup. Yum! This was great, however when you said “2” waffles, i was prepared to see 2 full waffles (that cover the entire grate) so i made waay to little.